Way back in the Mesozoic era of computing (also known as the early 1980s), we didn't have slick little netbooks or big, powerful desktops. Businesses that used computers at all generally relied on Unix servers or ancient mainframes driving terminals at employees' workstations. Meanwhile, home users could choose from a narrow assortment of systems, none of which bear much resemblance to the array of computers for sale today; and one of the most popular models back then was the Commodore 64. The makers of the C-64 included a hard-coded copy of BASIC on its internal ROM so you wouldn't have to boot from a 5.25-inch floppy disk, as you did with most contemporaneous PCs. The machine had a generous 64 kilobytes of memory, and you loaded programs into it from a tape drive--eventually to be superseded by a painfully slow floppy disk drive (the legendary 1541). 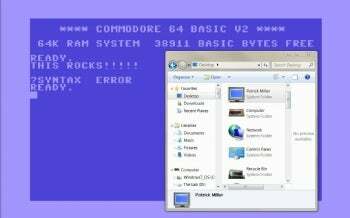 This Commodore 64 theme pack re-creates the look of a C-64, only on a slightly newer platform: Windows 7. It contains three backgrounds that reproduce the familiar look of the old C-64 screen. It also has desktop icons for your User folder (a miniature C-64 screen); your My Computer link (a C-64 computer), and Recycle Bin (that 1541 floppy drive-the green LED illuminates when the Recycle Bin contains something). The window colors re-create the beige of the C-64's casing, and the system font should look familiar to any C-64 user. It's easy enough to install--just download the .THEMEPACK file, double-click on it, ignore any scary Windows 7 alerts (we promise, the file is innocuous), and let it fly. The theme doesn't contain any sound because unless you actually told the Commodore 64 to make noise, it was a pretty quiet machine. Make sure that your Computer, User, and Recycle Bin icons are visible when applying the theme! To create the icons, I used EasyIcon Maker (which has a limited free-trial period), IcoFX (which is free), and Paint Shop Pro X2. I used original images of the Commodore 64 and the 1541 floppy drive that I found in Google Image Search. I nabbed the screens from a Commodore 64 emulator called CCS64, created by Per Håkan Sundell and available for free download. Running the emulator requires DirectX 9. Though you can use the CCS64 emulator to play ROM game files, any attempt to download them puts you in a gray area of copyright. If you choose to proceed, you're on your own. Game at your own risk! If you'd like to see how the original Commodore 64 was put together, check out our piece-by-piece dismantling of the machine in "Inside the Commodore 64."